Flatirons Tuning Rally Team Starts 2008 with Back-to-Back Wins. Boulder, CO – After sitting out the first round of the 2008 Rally America National Championship, the Flatirons Tuning Rally Team got off to a dominating start to their 2008 campaign with back-to-back wins at the Rally in the 100-Acre Wood and the Olympus Rally. The back-to-back class wins as well as strong finishes overall have put the Flatirons Tuning Rally Team second place in the Production GT championship as well as eighth in the Rally America National Championship overall points. “In terms of the Championship we couldn’t be happier. To win in Missouri in such difficult conditions was fantastic and to have the Flatirons Tuning Subaru Impreza WRX perform flawlessly and put us on the top step of the podium again at Olympus was perfect. To finish first in Production GT and take solid overall championship points at both events was exactly what we were looking for as we started 2008.” Stated driver Stephan Verdier. 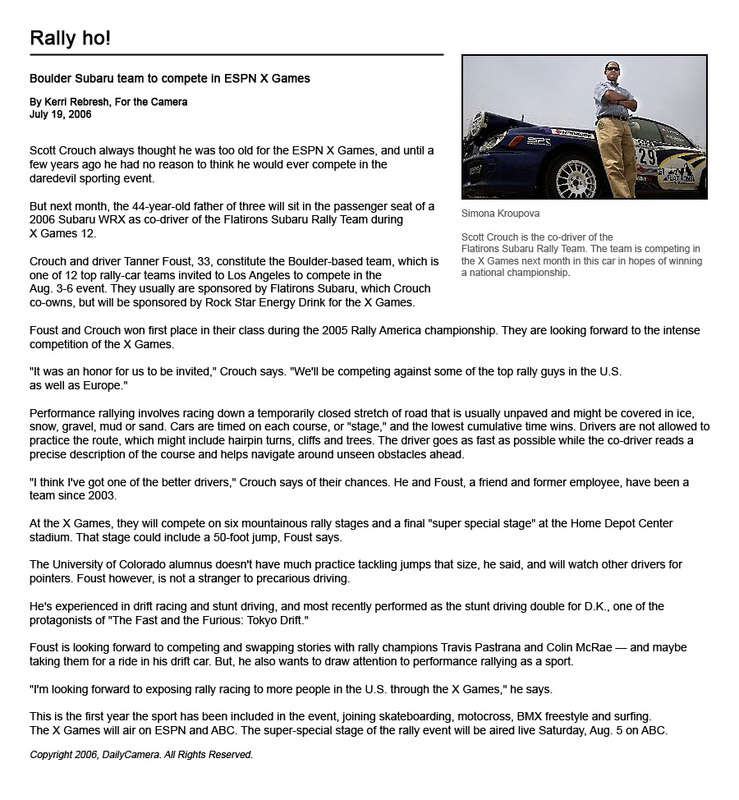 The success of 2008 comes on the heels of a tough 2007 season that saw the Flatirons Tuning Rally Team win three rallies and fail to finish in four other events forcing the team to re-evaluate its strategy before 2008. “In 2007 I think we were focused on too many different things and not focused enough on the individual rallies. For 2008 we are focusing more on one rally at a time and it is paying dividends. Obviously we would love to win a championship again and be invited to the X Games but for 2008 we just want to go rallies and focus on having the best rally we can instead of constantly thinking about other things.” Stated Verdier when talking about the teams plans for 2008. With a relaxed focus and strong finishes the Flatirons Tuning Rally Team is in a strong position to secure one of the coveted invitations for the ESPN Summer X Games. “In 2006 we were one of the first teams to be invited to participate in the Summer X Games and in 2007 we just missed earning an invitation. Right now we are just focusing on doing the best we can at each rally and know that if we run the rallies we are capable of as a team we should be able to secure an invitation for the 2008 Summer X Games.” Noted co-driver Scott Crouch about how the team is approaching the qualification process for an invitation to the X Games. Two events remain before the mid point in the 2008 Rally America National Championship schedule as well as the expected awarding of invitations for the ESPN Summer X Games. It is expected that the top eight overall teams will qualify for an invitation to the ESPN Summer X Games in addition to up to four special invitees or last chance qualifier positions. Invited competitors will then participate in the ESPN Summer X Games Rally Car event in front of thousands of live spectators and millions home TV viewers on live national television between July 31 and August 2. The 2008 Rally America National Championship consists of a series of nine events held in eight states coast to coast in the United States. Teams count their best seven finishes at the end of the season in a variety of different classes to determine class championships in addition to the Rally America National Champion which will be crowned based on overall points earned at each event. Flatirons Tuning is based in Boulder, CO, and is an aftermarket performance and maintenance specialist as well as being home to the Flatirons Tuning Rally Team. In 2005 the team was Rally America Production GT National Champions and in 2006 and 2007 were early front runners before late season misfortunes ended their championship runs. The Flatirons Tuning team for 2008 consists of driver Stephan Verdier, co-driver Scott Crouch, and lead technician and performance specialist Jon Brouillet. In addition to support from Flatirons Tuning the Flatirons Tuning Rally Team is also supported by Global Collision, COBB Tuning, and Cusco. I really enjoyed the oregon trail rally. The blog is also helpful in terms of helping both amateur and professional tuners out there in modifying there car seeing tips in here.